I posted last week about what I called the Audio Book Revolution. In it, I suggest that audio books have a place, along with ebooks and everything else, in the conversation about the future of publishing. They indeed do, but don't think I'm making a big deal about it. In fact, I don't ever want to make a big deal about any medium to translate written thought from one person to the next. I'm really not that passionate about it. The world needs strong, insightful, well-considered writing. And we shouldn't care too much if we get it from a paper book, an ebook, an audio book or a computer. Because, when it comes right down to it, all reading devices are fetish items. They all exist to get the good stuff from the writer to you. That's their only purpose, and to give them powers they don't have is silly. I've said it before, I'll say it again: Shakespeare is Shakespeare no matter where you read it. Having said that, there is one reading device I would miss should it ever disappear, and that is the book. You know, the one made with paper. And, funny, it's not so much the paper book I'm concerned about, it's the bookstore. And it's really it's not even so much bookstores as the independent bookstore. I went to Powell's on Hawthorne this past week to hear Gina Frangello and Zoe Zolbrod read from their latest works. I browsed the stacks, bought two paperbacks, listened to the readings, met three writers. The trip really made my month. And then it hit me when I got home: Nothing says Powell's--and indie bookstores in general--are going to be around forever. Hard to imagine, but not impossible. Just look at what indie bookstores had to compete against ten years ago. That shelf at your local Goodwill where everything's a buck. And now they have to compete against ebooks, a medium that does not require a bookstore to get the words to you at all. Kind of scary, if you love independent bookstores. So, support your local indie bookstore, if you want indie bookstores. I know I do. 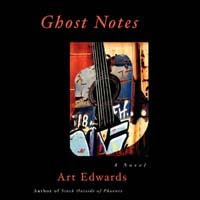 Try Ghost Notes the Audio Book as an unabridged digital download. Or try Ghost Notes the Ebook. With all the ebook hype out there, I can't help but notice that few are writing about what I think of as the most exciting new medium for fiction. Yes, you guessed it. 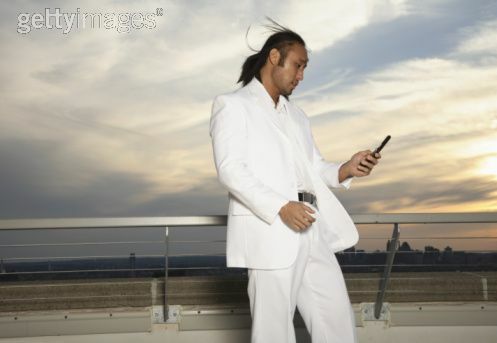 I'm talking about texting the contents of your novel from a rooftop while wearing a white suit. No, not that (although I think there's potential there, too). I'm talking about audio books. Few commercially-published novelists and non-fiction writers have audio book versions of their works. I feel very lucky to have stumbled into one myself. I love that The Nervous Breakdown's new book publishing arm will give the audio book the dignity it deserves. That's forward-looking, in my opinion, which is what we've come to expect from The Nervous Breakdown. 1) You don't actually have to "read" the book. You just sit there and it reads itself for you. The experience, for me, falls somewhere between reading a book and listening to a play of the book. Unbelievably cool if you've got a long journey ahead of you, especially a driving journey, when your eyes need to be occupied elsewhere. 2) Unlike ebooks, you have more latitude with where you can experience an audio book. Specifically, you don't have to be tied to a computer to listen to your book. If you follow this blog, you know how I feel about being tied to a computer (short answer: it's the biggest downside of ebooks). I usually listen audio books in my truck, but any CD player works, as do iPods. 3) Like ebooks, you can get an audio book right now. Yes, NOW. Many, if not most, audio books are available somewhere on the internet for download. There's no waiting for your CDs to arrive in the mail, no driving to the bookstore. My audio book is download-able at CDBaby for the excruciatingly low price of $4.99. Never tried an audio book before? This might be the cheapest one you'll find anywhere. Give it a shot, and make your next long car, train, or plane zip by. Can You Teach (Rock and Roll) Writing? Yes, one can teach rock and roll writing, like I will in my all new, never-before-ventured online rock and roll writing course at the Basement Writing Workshop in October. 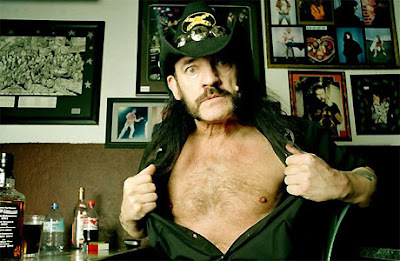 Let's say you want to write about your favorite band, Thin Lizzy. You write a personal essay about how their 1976 album Jailbreak changed your life. You submit it to workshop, wanting feedback. People will read it and probably love aspects of it. And probably there will be other things that don't quite work for them. "Wait," you say. "People are going to judge my essay? What elitist horseshit. Who are they to judge my feelings about my favorite rock album?" You see, that's just it. In any good writing course, people absolutely would not judge your feelings about your favorite rock album. They'd judge the rendering of your feelings about your favorite rock album. They'd critique your writing, not you. There might be feelings expressed in your essay you could flesh out better, or arguments you could make more convincingly, or descriptions that could be more vivid. This will be the case with most everyone's work. There will be something about everyone's writing that is remarkable, and something that doesn't quite come together. It will be our job to suggest ways to make it better. Now, are these suggestions easy to take? If they are, you probably don't have much invested in your writing. But there will be comments that will have that ring of truth to them, that will make you take pause and wonder if your work could indeed be better. You can always choose to ignore any comments, or you can revise your work with the comments in mind. As the writer, it's your job to make those decisions. Also, in case you were wondering, in my course it will not be my or anyone's job to try and convince you that Jailbreak isn't the greatest album in the world. That's not at all what we'll do. Any good writing class takes the work you bring to workshop and tries to make it better. I don't want you to write my ideas about Jailbreak--if I wanted that, I'd write my own essay--I want to read about your ideas of Jailbreak, because it will tell me as much about you as it will about Jailbreak. So, that's how one teaches rock and roll writing. Take the renderings of your ideas about rock and roll and make them better. It's fun, and stimulating, and a great way to hone your writing skills. And if you sign up now for the course, you get 15% off. "What is rock and roll writing?" This is the first question I received after my announcement that I'm teaching the all new, never-before-ventured online rock and roll writing course at the Basement Writing Workshop in October. Fiction like Nick Hornby's High Fidelity, or Roddy Doyle's The Commitments, or Tom Perrotta's The Wishbones. Non-fiction like Chuck Klosterman's Fargo Rock City, or Michael Azerrad's Our Band Could be Your Life, or Steve Almond's Rock and Roll Will Save Your Life. But it doesn't have to be like any of those. It can be music reviews. It can be a biography of your favorite band. It can be a blogged top ten list of your favorite songs, updated by the moment, with elaborate explanation. 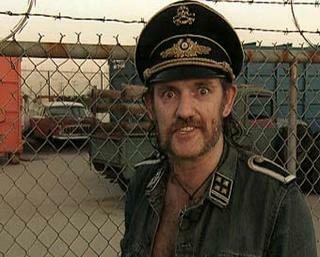 It can be short stories with Lemmy as the protagonist. Maybe rock and roll writing is what people write who have guitars stored somewhere in their houses. Go check to see if you have a guitar in one of your closets. Do you? Yes? Then at some point you will probably turn to rock and roll writing. You might write about the first time you fell in love with music. Or your first instrument and how much you loved it. Or the first, most recent, or favorite rock concert you ever attended. Or the first time you heard Lemmy. If you were ever in a band, you will surely write about forming the band, or playing your first gig, or best gig, or worst gig. You will surely write about the band that broke your heart. If you were ever a solo artist, you may also write about your first solo gig, or best gig, or worst gig, or an obnoxious spectator at one of your gigs. You'll write about your best song, or best album. Or worst. It's inevitable. We have to write about our rock and roll lives because, no matter what we've done since, it's part of who we are. For many, it's a big part. So what is rock and roll writing? It's what people like us write about when we write about who we are. And that guitar in your closet, the one that barely makes it out these days? That's a big part of it. 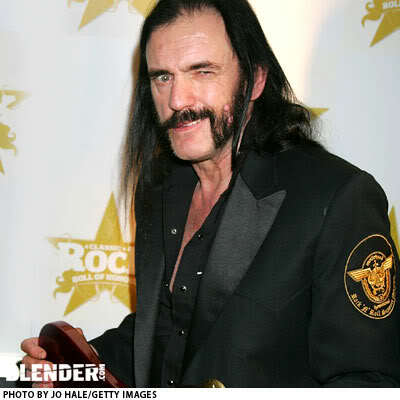 And Lemmy's a big part of it too. Sign up now for my online rock and roll writing course at the Basement Writing Workshop and get 15% off. Rock lit fans have been blessed already this year with Rock and Roll Will Save Your Life, a book by Steve Almond that I rank with Fargo Rock City and Our Band Could be Your Life as one of the best rock non-fiction books in existence. On a whim the other day, I went to Salon's book page and found out about the new Jennifer Egan novel, A Visit from the Goon Squad, which features prominently a character who's a record producer and veteran of the SF punk rock scene of the 70s. Now, I love, love, love rock non-fiction, but I get positively ga-ga over rock fiction. Egan's novel doesn't look like a contender for the ever-elusive Great American Rock Novel--her book, at first glance, doesn't rely heavily on a rock and roll setting--but I'd be tickled to be proven wrong. Look for an AVFTGS book review here sometime in the next month. Then, of course, there's Nick Hornby's latest, Juliet, Naked. Much rock lit goodness there, no doubt. It's in my Powell's cart. All of this rock lit attention from big publishing has me thinking crazy thoughts about a rock lit revolution...again. 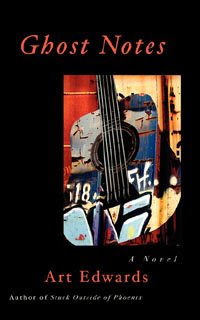 Way back in 2004, I published ten reviews of rock lit classics at my website. The pages are no longer available, but there's still a list I published at Amazon years ago of some of the greatest rock reads ever (along with, ahem, my own). Here's that list. I still stand by all of them. It seems strange to me that more great reads don't exist in this genre. Think of all the people touched by rock music--who bought CDs, attended concerts, bought guitars--and you'd expect more great rock lit to follow. Many have tried, of course, but few have succeeded, and many great writers gave up after one--usually unprofitable--effort. But I'm just foolish enough to think things can change. People are finally tired, I think, of what corporate publishing deems worthy of high advances and massive push, and are ready to give something new a chance. Throw in a bunch of rock-happy indie writers--like those who blog regularly at places like The Nervous Breakdown--and I have to believe something is brewing. It might not be the next Chick Lit...but then again, who's to say it won't be? Great genres are carved by great writers, and if great writers are giving the subject serious attention, it won't be long before things change. In fact, I'd go so far as to call it inevitable. I, for one, am doing my part to make rock lit the next big thing (or maybe the next next big thing). I'm teaching an online course called rock and roll writing at the brand new Basement Writing Workshop. My class is ten weeks long, and you'll get to submit plenty of your rock-tinged work for critique (fiction and non). We'll discuss the special challenges writing about music poses, and the special advantages of the same. Beyond that, there's sure to be plenty of frank discussion about who the greatest band in the world is. It promises to be fun, and stimulating, and fun. Do you have what it takes to write the next rock lit masterpiece? There's only one way to find out.